'IN VITRO' and modest reductions in Temperature can cause irreversible disruption of the meiotic spindle, with possible chromosome dispersal. Embryos subjected to such heat shocks have high proportion of chromosomal abnormalities and this may contribute to the high rates of pre-clinical and spontaneous abortion. 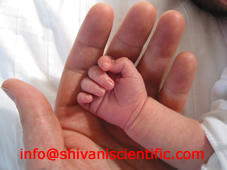 Therefore, temperature control is of paramount importance and should not be compromised in any way right from Ovum Pick Up (OPU) till Embryo Transfer (ET).